A proper Greek frappé is very strong, though sugar-milk-coffee-water ratio is a personal preference. So don’t let the norm stop you, experiment and reach your own perfection of Greek frappé. A point to note though is that froth specific to Greek frappé is due to sugar granules, so for better taste and frothy coffee you may want to use sugar. 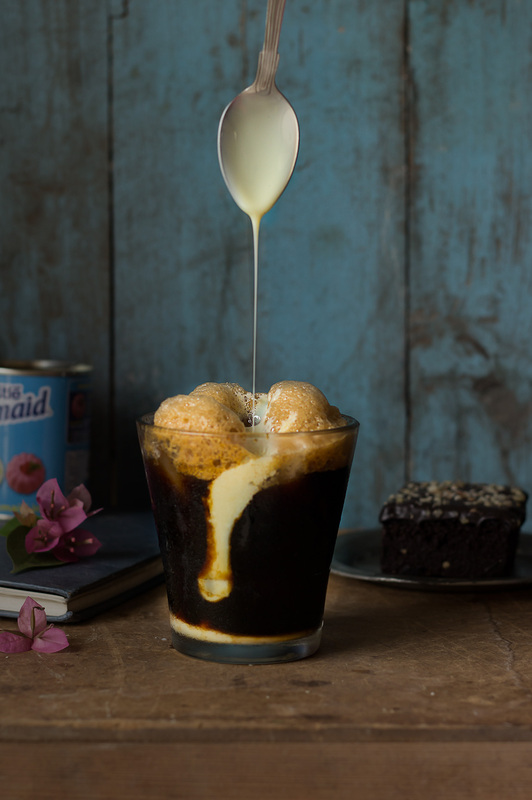 In this post, I will detail the steps involved and the technique used to get a good Iced Coffee but as I said, proportion can be played around with as per your taste. Milk can be added, though many people I know drink coffee without milk and the Greeks drink with evaporated milk. The level of sweetness – plain (no sugar, medium or sweet) also matters. So create your own jazz with coffee. I am not a great drinker of cold coffee or frappés in general, but I do enjoy an occasional treat. I absolutely loved the way froth develops in this frappé due to the intense shaking. You can even make this frappé ahead, pour and enjoy when the mood strikes. A great choice if you are coffee lover.